South Texas' Premiere Brass Ensemble! The North American Brass Band Association (NABBA) is an organization dedicated to the promotion and development of the British-style brass band movement in North America. With bands and musicians covering 15 states and Canada as well as ranging from school-age youth to senior citizens, NABBA has become a true force in the arena of amateur musicians and brass banding across North America and across the world. 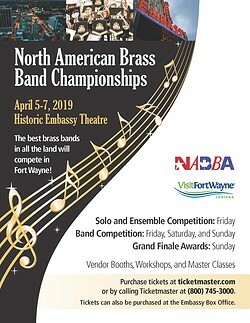 The 2019 NABBA Championships will be held in Ft. Wayne Indiana from April 5 - 7 in the Historic Embassy Theatre. This year the San Antonio Brass Band will be competing at the top level (Championship) putting our hard work and talants up against the very best bands from across North America. Each band performs one test piece chosen for all the bands in their section to compete with as well as one choice piece picked by each individual band. Three judges behind screens listen, critique and numerically grade each bands performance coming up with three winners from each section. The SABB is comprised of university professors, music educators and private teachers, as well as real estate professionals, philosophers, IT system engineers, homemakers, law school students, current and retired members of the San Antonio Symphony, USAF Band of the West and the 323rd Army Band, and others, creating a unique mix of volunteer musicians.